The case of where Joey Carbery will play his rugby next season is one in which the IRFU and Leinster are understandably fighting their own corners. The IRFU want Carbery to move to Ulster to ensure he gets regular game time at out-half ahead of the 2019 Rugby World Cup. Leinster want Carbery to stay, without the guarantee of playing at out-half, so that they can continue to compete on two fronts; the PRO14 and the Champions Cup. Ulster Rugby is under time pressure as they look to sign an out-half to replace the sacked Paddy Jackson. A decision has to be made quickly in order for Ulster to make alternative plans, should they be necessary, as recruiting can't start soon enough. At least Dan McFarland has been appointed as head coach for three years to give Ulster some semblance of stability off the field. In the meantime, Carbery is being pulled in two different directions as Leinster look to prime him as the long-term successor to Rob Kearney and the IRFU work towards what is in the best interests of the senior Ireland squad. What makes this situation intense and complicated is that each party has an understandable and a conflicting position. The priority for Joe Schmidt is to ensure that Ireland are in the best possible position to deliver what they have never done before, a World Cup semi-final in Japan next autumn. He has been scarred by how Ireland were depowered by the loss of the spine of their leadership crew that led to their 2015 quarter-final demise against Argentina. He wouldn't be doing his job if he wasn't doing everything he could to get Ireland to Japan in the best possible shape. However, it has been established that Carbery cannot be forced to move to Ulster without his consent. In recent weeks, there have been reports of how Schmidt has, more or less, ordered Carbery to make a move in his best interests. This is untrue. He can and has shared his vision for the future and where Carbery fits into it. Quite simply, Schmidt cannot travel to Japan with his second-choice out-half playing full-back for Leinster next season. That has been the case this season and, in the Six Nations, Carbery did not play with the authority or the rhythm that comes with regular minutes at number ten. That is why it must have been frustrating for Schmidt to see Leinster again select Carbery at full-back against Connacht last Saturday. In Galway, Caelan Doris became the 55th player used by Leinster this season. A lot of this has to do with how many Ireland internationals they lost for the November Series (18) and for the Six Nations (20). Overall, there were 23 players involved for Ireland for one or both of those windows. The drain on their resources is much greater than any of the other provinces. It its true that Leinster enjoy the advantages of population, resources, the schools system and a wide-ranging, highly-skilled coaching structure to identify and develop talent. There is a school of thought in Leinster that they are being punished for the sins of others in failing to develop professionals. Ulster, Munster and Connacht have already benefited from an influx of Leinster Academy players. For example, Jordi Murphy has committed to joining Ulster in the summer, where John Cooney, Alan O'Connor, Dave Shanahan and Nick Timoney reside, as well as ex-Ireland U-20s Greg Jones and Jack Regan in their academy. However, there comes a point when Leinster have to 'push back' because of their commitment to compete on two fronts, especially in Europe where French and English clubs enjoy far superior spending power. Leinster must see the pressure to move on arguably their most talented young player, as a line in the sand. Three weeks ago, Leinster started Carbery at out-half against Benetton Treviso for the first time this season. This had precious little to do with placating Schmidt or handing Carbery a lifeline at out-half. Similarly to Schmidt's Ireland stance, Leo Cullen and Stuart Lancaster have to do what is best for Leinster. This was to give the 22-year-old a hit-out at ten one week before being listed as Jonathan Sexton's back-up in the Champions Cup semi-final. However, two weeks later, Carbery returned to full-back for the slaughter by Connacht. 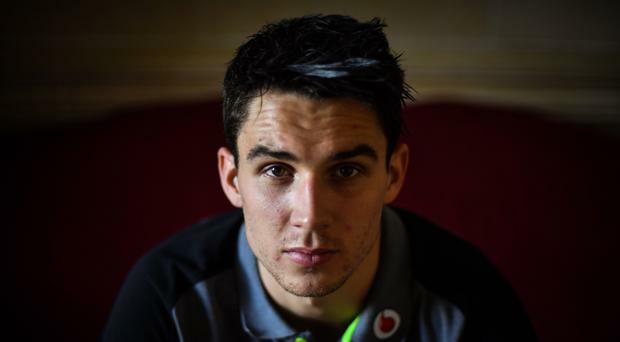 The next day, a meeting took place between Carbery and Schmidt at a café in South Dublin. Since then it has emerged, for the first time, Carbery could be willing to consider a short-term deal to move to Belfast. The player has consistently stated how out-half is his preferred position and how he wants to stay at his home province Leinster. There is a complication there in that the IRFU holds all contracts and Carbery could be vulnerable to what terms are offered in his next deal. He might just be convinced to take any short-term pain of moving to Ulster in return for the long-term gain of playing out his prime years back at Leinster. In the meantime, he knows Leinster have Ross Byrne at out-half, Ciaran Frawley making an impact and Harry Byrne, Ross' brother, coming into the Academy. The landscape could be changed by the time Carbery is able to come back. No wonder he is torn between what he wants to do and what he will do.